Each person has different learning preferences and styles that benefit them. Some may find they even have a dominant learning style. Others that they prefer different learning styles in different circumstances. There is no right or wrong answer to which learning style is best for you – or mix of learning styles. By discovering and better understanding your own learning styles, you can employ techniques that will improve the rate and quality of your learning. There has been a big push in education in recent years on how teachers can better meet the needs of the students, and a very effective way to do that is to learn about different learning styles. The more teachers understand their students and the way their brains work, the better they can be at helping them learn. Even if you’ve never heard the term “learning style” before, it’s likely you already have an idea of what your learning style is. You probably know if it’s hard for you to learn by listening, but if you get your body up and moving around, things click instantly. Or maybe you love listening to audiobooks, but nothing seems to make sense when you sit down to read a paper book. What you’re describing when you talk about yourself in this way is your learning style. This guide will help you understand what each learning style is, as well as how teachers can alter their instruction to help students of each learning style. For teachers who already have a lot on their plate, it can seem like a lot to add in adjusting instruction for different learning styles. The great benefit teachers will find though is that once they master ways to appeal to all learners, their lives actually become a lot easier. Catering to different learning styles can improve classroom management, and it makes for happier students in the classroom. The chatty student who is constantly interrupting will finally have a positive place in the classroom. The quiet girl who knows all the answers but never raises her hand will feel confident in sharing her knowledge. Understanding your learning style and that of those around you isn’t only helpful in educational settings. It can also help you understand yourself and others in work, families, relationships, and other settings. If you’re a parent, knowing the learning style of your child can be extremely beneficial as you help them with their schoolwork and as you just relate to them in daily life. Maybe there actually is a valid reason they zone out every time you tell them what to do. With so many studies on learning styles, there are a lot of theories about how many learning styles there are and what each one should be called. 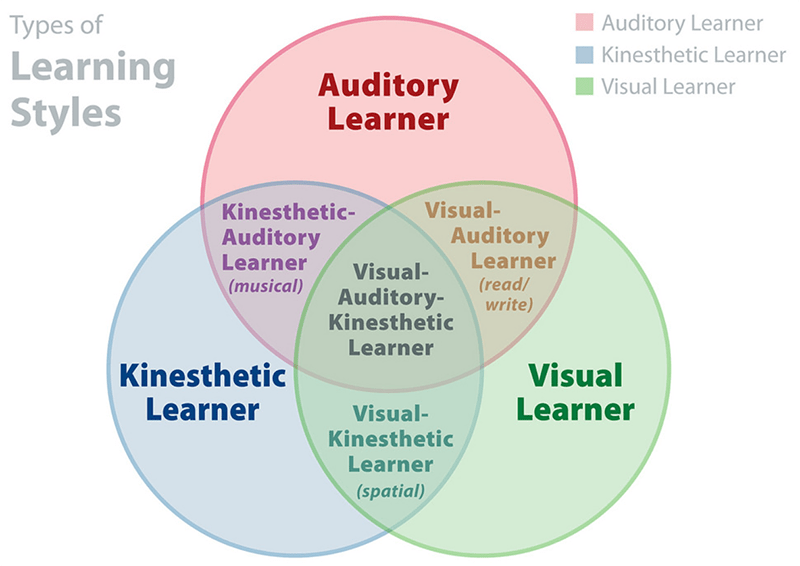 One of the most influential studies found three learning styles: visual, auditory, and kinesthetic. This was called the VAK model. Since that study, another dominant style has been identified as reading/writing, and the model was expanded to become VARK. According to Neil Fleming and David Baume, it’s important for teachers to understand how their students learn, but it’s even more important for students to understand how they, themselves learn. By understanding your own process of learning and thinking, you can be more efficient in studying and learning. It can be really frustrating to sit in a classroom and not understand why you just don’t get it. You know you’re not dumb, but you just can’t seem to make the information click. It can also be frustrating to be able to learn perfectly well from one teacher, but struggle to learn from another. If you’ve experienced feelings like this, it likely all comes back to your learning style. Once you understand how and why you learn the way you do, your education can vastly improve. You can stop feeling dumb and getting frustrated, and you can start to advocate for yourself and your education. "VARK above all is designed to be a starting place for a conversation among teachers and learners about learning. It can also be a catalyst for staff development- thinking about strategies for teaching different groups can lead to more, and appropriate, variety of learning and teaching." This type of thinking, called metacognition, helps you understand who you are and how you learn. It would be impossible to discover your own learning style without engaging in metacognition. It’s very common for people to have one dominant learning style, but it is highly unlikely that any one person will strictly have one learning style. Most people are a combination of many. This guide and the research talks about each learning style with different labels, but the label isn’t what’s important. What is important is understanding your brain and the way you learn. Try not to get caught up in labels or classifying yourself or others. Note that it does not include the reading/writing addition that was added when VAK expanded to VARK, however it does include the four above mentioned categories. Within memletics, there is a lot of overlap between learning styles due to the nature of the categories. Take, for example, two solitary learners. They both learn best in solitary situations, but one learns best by using logic while the other learns best by seeing. "According to the Memletics model, everyone has a mix of learning styles, and learning styles are not fixed (Advanogy.com, 2003), so instructors should also accommodate other types of learning styles by providing diverse learning environments. McCarthy (1980) points out that instructors should vary activities so that students learn in their own preferred style and also can have a chance to develop other styles as well. As a result, matching and mismatching learning styles and instructional methods will complement the students’ learning performance and create more flexible learners in the long run." As Srijongjai suggests, students and teachers should not think of learning styles as a box to be placed into. Learning styles are just one small piece in the overall puzzle of student learning. No matter what theory your dominant learning styles fall under, knowing your style can help make your learning easier and more successful. Most learners fall into at least one of the styles in the VARK theory. This guide will offer information and advice to teachers, students, and parents, as it is important for everyone in the educational environment to understand why and how people learn the way they learn. With each learning style, there are also suggestions included for career choices.These suggestions are in no way meant to be limiting, but they can be helpful. If you are a visual learner, but feel pulled toward one of the fields listed in the auditory learner section, by all means pursue your passion. The career suggestions merely show what careers that style might gravitate towards as well as careers they are likely to excel in with minimal effort. Understanding your learning style is really helpful, but again, you should also be careful not to put yourself in a box and to define yourself by your learning style. Take what insight you can, but don’t let it overcome your thoughts about yourself. Do you ever remember taking a test in school and thinking “I don’t remember the answer, but I remember I had it highlighted pink in my notes”... then you might be a visual learner. That’s because visual learners remember and learn what they see the most. This could include videos and pictures, but it doesn’t have to. Visual learners do well with spatial reasoning, charts, graphs, etc. Often, visual learners “see” words as pictures or other objects in their head, and they often use their right brain to process information. One of the many benefits of being a visual learner is that the human brain processes visual information much faster than plain text. As a visual learner, you can take in and retain a lot of information really quickly because you prefer this processing method that humans are already very good at. When studying and learning, visual learners prefer the use of maps, outlines, diagrams, charts, graphs, designs, and patterns. When taking notes, these students are more likely to organize their notes into visual patterns. They might use charts or diagrams; they might separate their page of notes into different sections. Many visual learners also do well with color coding their notes with different colored pens or highlighters. Visual learners are often pulled toward, and do well in, STEM fields. STEM stands for science, technology, engineering, and math. Specifically, some careers include photography, construction, graphic design, interior design, architecture, physics, advertising, engineering, and surgery. Sometimes these students might stare out the window or doodle in their notes. If this is the case, let them. Locking their eyes on you constantly might be too much visual stimulation, and that flower they’re drawing next to their notes might help them remember that point by connecting it to their visual drawing. It’s also easy for visual learners to get overwhelmed by a lot of visual input. If the classroom setting is chaotic with a lot of students moving around, it might be too much for them to take in. The design of your classroom is also very important to visual learners. If there is a lot of clutter or too many posters adorning the walls, this can overwhelm the mind and processing of a visual learner. For some visual learners, it also could actually be helpful for them to pay careful attention to your movements. They might remember the silly hand motion you made or the way you pointed to a country on the map. Keeping that in mind when delivering your lessons can be very helpful. Use colors. Just like these learners tend to color code things themselves, it can be really helpful for them if you color code your notes as you write them or post them. As a homework or in class assignment, you could have students annotate/read actively, and use different colors for different things you want them to look for. For example, they could highlight dates in blue and names in yellow. Draw reasoning. In math, teach students how to draw out their reasoning (rather than verbally explaining). Use gestures. As you’re teaching, be aware of your body language. If you include gestures and hand motions when you speak, it will help your visual learners pay attention and make connections. Posters. As a project or class assignment, students can make posters illustrating key concepts. Once finished, they could even present their posters to the class, which would appeal to auditory learners. You can also hang these posters on the wall when students are done as decorations and to help drive home important topics. Just remember to cover them up or take them down during assessments if they give away too much information. Charts and graphs. Use technology to help students visually see information by creating charts and graphs. This is often used in a math and science setting, but can be used in other disciplines as well. For example, in gym class, students could keep track of how many push ups, sit ups, etc. they can do and then you can create a class chart or graph with the data. Draw the text. In the language arts classroom, pick out a portion of the text with especially vivid imagery. Instruct students to draw a picture of what the writing describes. This helps students with close reading and understanding of the text. Do you sometimes talk to yourself when you’re thinking really hard, studying, or trying to organize something? If that sounds like you, you’re likely an auditory learner. Auditory learners learn best by hearing and carefully listening. This can include hearing things from external sources, as well as hearing themselves talk. They are very likely to volunteer to answer questions and to actively participate in classroom discussions. Auditory learners have a great advantage in the classroom because they’re not afraid to speak their mind and get answers to their questions. While reading/writing learners might not even realize they have a question until they’ve had time to go back and process their notes, auditory learners learn by listening and speaking, so they process through information very easily right there in the classroom. Any form of listening or speaking is going to be the most efficient learning method for this category. Some popular methods include lectures, audiobooks, discussion, and verbal processing. These learners are typically good at storytelling and giving speeches as well. A lot of these students often prefer studying and working in groups because they can talk through the information. This often makes them social learners when looking at the theory of memletics. Any job that requires a lot of listening and/or speaking is likely going to be a great fit for an auditory learner. Some careers to consider include radio or TV broadcasting, law, teaching, speech-language pathology, and counseling. Just like the visual learners, these students also might stare off into space, but for a different reason. Since they process information best by listening to it, they don’t need to look at the notes or the PowerPoint very often. It might seem like they’re zoning out or not paying attention. If you’ve ever caught a student staring off into space and asked them a question, thinking you’ve caught them off guard, only to get the perfect answer, you’ve likely found a very auditory learner. These students might also tend to get chatty during class. This can be great when you’re trying to get a lively class discussion or debate going, but not so great when you need the class to listen intently to you. Instead of getting frustrated and angry, remember that this is how their brain works and how they learn. As much as you can and as much as is practical for your subject matter, try to facilitate discussions and play into this rather than squashing it. You should always keep in mind that these learners might really struggle with written and visual information. Auditory learners are those students who can answer every single question you ask in class, and then get a 60 on an exam that’s testing the same information. If you have a hunch that a student who bombed a test actually knows the information, give them a chance to verbally answer the test questions. Audiobook. Give students the option to listen to an audiobook- this can be effective with novels as well as textbooks. Socratic Seminar. This is a type of discussion where the students lead the discussion. The teacher provides some topics to talk about, and then the students take over. By sitting in a circle and having a more laid back atmosphere, more students are likely to join in the conversation. Often auditory learners tend to lead these discussions, and it gives them a chance to shine and be rewarded for their talking that can get them in trouble in other situations. Teacher Kelly Gallagher offers a great handout called trace the conversation that can help auditory and visual learners with Socratic seminars. There are many ways to conduct socratic seminars; the National Council of Teachers of English has a great explanation. Speeches. The often hated, but necessary, school assignment that many students dread is actually often a favorite of auditory learners. This type of assignment is where auditory learners feel in their element. Speeches can be short and impromptu or long and planned, and they can be done in any subject. Record notes. You can either record yourself speaking or give your students permission to record during your lectures so that they can go back and listen. You can also encourage students to record themselves reading their own notes. Text to speech. This is something students can do on their own, but they might need your prompting or feel better about doing it if you give them permission. When writing essays, students can use speech to text to capture their thoughts. It can also be beneficial to then use text to speech to proofread and catch errors. Debate. A structured debate is a really beneficial way for auditory learners to get their ideas across. This can be done at all grade levels and in all disciplines. Here is a great resource for some debate ideas, as well as different debate formats for different grade levels. Do you tend to zone out when people are talking to you or you hear a lecture? Would you rather read the transcript or get the information from a book? Then you’re probably a reading/writing learner. Reading/writing learners learn best by, well, reading and writing. They often relate to the famous Flannery O’Connor quote “I write because I don’t know what I think until I read what I say.” Verbal input can often go in one ear and out the other for these types of learners. For them, seeing notes on the board or on a PowerPoint is really important, as is taking their own notes. These students learn best from books, lists, notes, journals, dictionaries, etc. Some things these students might do to intuitively help themselves learn are rewriting their notes, using flash cards, adding notes to pictures or diagrams, choosing a physical book over an audiobook, and using closed captions on videos. A common and obvious career choice for reading/writing learners is writing, but if this is your learning style, you’re definitely not limited to writing. Editing, advertising, researching, translating, and economic advising are also great career choices that would be a good fit. While these learners are often your typical “good student” they can really struggle to learn from lectures or completely auditory methods. They may not respond well to class discussions, and need some more time to process things that they hear. If you give them some time to write their thoughts down before asking them to share out loud, they will feel less stressed and will be able to process their thoughts. Every teacher has had that student who needs more time before you move on to the next slide, even though you’re done explaining and all the other students are ready to move on. A reading/writing learner is most likely that student, and when you understand their learning style it’s easier to cut them a little slack. Sometimes they struggle to get all their notes down because they are trying to write down every single thing you say. You can really help them by working with them to pull out the most important parts of your lecture and to paraphrase what they hear. Handouts. No matter what your lesson is about, one of the best things you can do to help reading/writing learners is provide handouts highlighting the most important information. It’s also important to give these learners enough time to write detailed notes. Providing handouts or guided notes can help these learners have enough time to get down all the information. Essays and reading assignments. These simple, traditional assignments often work best for reading/writing learners. This is why this learning style often thrives in the traditional classroom setting. Vocabulary stories. Have students create stories or plays to make their vocabulary words more fun and interesting. This can be done in any subject area that has vocabulary words. You can give students a topic or let them be creative, but all they have to do is write a story containing x number of their vocabulary words. You can also extend this activity to help kinesthetic learners by having students act out their stories for the class. Think, pair, share. Reading/writing learners often struggle with sharing their thoughts out loud. Those students who ace every test but freeze when you call on them in class are likely reading/writing learners. Think, pair, share can really help give them confidence to verbalize their thoughts. This, again, can be done with any age group and in any subject area. First, ask students an open ended question and give them time to silently think and write their answers. Then, have students pair up in small groups to share their answers. Finally, open the discussion to the whole class. Often when you just ask a question and want students to respond right away, you’ll only get answers from the auditory learners because they are the quickest at verbal processing. This method though gives the reading/writing learners time to process in their own way and gives them time and confidence to construct a verbal response. Are you the first one to get up and volunteer to demonstrate an experiment for everyone else? Do you need to actually change the oil, rather than look at a diagram, in order to learn how to do it? If so, it sounds like you’re a kinesthetic learner. The root word “kines” means motion, and as such, a kinesthetic learner learns best by going through the motions or actually doing something. When they are actively moving their body and combining that with what they are learning, it’s much easier for them to internalize the information. These students tend to shine in demonstrations and experiments. They also learn best from seeing something first hand, watching live videos, and going on field trips. Even just combining a physical motion with a piece of information can help them. They might fidget while they’re listening in class, and they are much more likely than those with other learning styles to talk with their hands. Any career that allows you to be physically active and move your body is going to be right up the alley of a kinesthetic learner. Sometimes they say the phrase “I don’t sit well,” and they typically don’t thrive at a desk job. Kinesthetic learners typically feel in their element as professional athletes, farmers, carpenters, physical therapists, and mechanics. Just because you see a student fidgeting or being antsy, that doesn’t mean they aren’t paying attention or that they’re bored. Their brain just craves that movement to help them make connections. There’s no need to force students to sit completely still as long as they aren’t distracting others in the classroom. As much as you can, try to connect movement to the concepts you’re teaching. Kinesthetic learners really just need to move and they can benefit from active brain breaks. Try to do your best to keep them active and to allow for movement in your classroom. If you look out to your students and see that glazed over look, pause your lesson for 30 seconds and have the whole class do jumping jacks. Or if you notice one of your kinesthetic learners just can’t take sitting in their seat any longer, ask them to run a quick errand to the office for you. So often these students get punished for trying to move and follow their natural learning style. The more you can find ways to reward them for their learning style, the more engaged they will become. Labs and experiments. These types of lessons are common in science classes, but they can be successfully implemented in the curriculum of all different subjects. For example, psychology students could replicate the studies they are learning about. An elementary math lesson could involve measuring the height of each student and then creating problems based on the measurements. Field trips. When schools are cutting their budgets left and right, it can be really hard to plan educational field trips, and that’s understandable. Field trips don’t have to be major events, though. For an art project, you could take students outside and have them draw or photograph what they see. An English lesson could include a nature walk where students journal or write a story about what they see when they’re outside. Physical props. Whenever you can, use practical and/or memorable props. When teaching a history lesson, you could dress in the attire of the era you are teaching about. If you’re an anatomy teacher, bring in a skeleton or use your own body as a prop. Take a stand. This is an activity that is very easy to set up and appeals to kinesthetic as well as auditory learners. To prep, come up with a series of questions that students can either agree or disagree with. If your students are reading To Kill A Mockingbird, your questions could revolve around racism, for example. (Note: if tackling a sensitive subject such as racism, make sure you know your students and their maturity level) Hang signs on either side of your classroom indicating “agree” and “disagree.” Then, read through each question and have students move to the side of the room that fits their belief. Once there, they can discuss their thoughts with the group that follows their beliefs, and then you can open up the discussion to the whole class. Act it out. This works well for literature and history lessons. Instead of reading silently, assign students parts and have them act out the story. Tableaux Vivants. Again, this works well in literature and history classrooms, and is a great review activity. It’s very similar to charades. Break students into groups and assign each group a “scene”- this could be from a work of literature or a scene from history. Each group works together to create a silent re-enactment consisting of “snapshots” of the scene. Students pose and pause for 5-10 seconds, and then move on to their next pose. Once they have moved through their poses, the rest of the class guesses what scene they were re-enacting. Demonstration speeches. As the famous quote attributed to Einstein says, “If you can’t explain it simply, you don’t understand it well enough.” Demonstration speeches give students a chance to explain something they understand really well in a simple manner so their peers understand. Students pick a topic, for example, how to make a peanut butter and jelly sandwich. They then give a speech explaining the process while simultaneously demonstrating the process. The demonstration portion of this is what really appeals to kinesthetic learners, and it appeals to all learners because students have a lot of freedom in choosing their topic. Individuals who excel at math and possess strong logical reasoning skills are usually logical learners. They notice patterns quickly and have a keen ability to link information that would seem non-related by others. Logical learners retain details better by drawing connections after organizing an assortment of information. Maximize your ability to learn by seeking to understand the meaning and reasoning behind the subject you're studying. Don't depend on rote memorization. Explore the links between related subject matter and make sure to understand details. Use 'systems thinking' to help you better understand the relationship between various parts of a system. This will not only help you understand the bigger picture, it will help you understand why each component part is important. Social learners usually have excellent written and verbal communication skills. These individuals are at ease speaking with others and are adept at comprehending other people's perspectives. For this reason, people frequently seek counsel from social learners. Social learners learn best working with groups and take opportunities to meet individually with teachers. If you like bouncing your ideas off others, prefer working through issues as a group, and thoroughly enjoy working with others, there's a good chance you're a social learner. If you're a social learner, you should seek opportunities to study with others. If the class you're in doesn't have formal groups, make your own group. Solitary learners usually prefer working by themselves in private settings. They do not rely on others for help when solving a problem or studying. Solitary learners frequently analyze their learning preferences and methods. Since solitary learners prefer to work alone, it is possible for them to waste time on a difficult problem before seeking assistance. However, solitary learning can be very effective learning style for students. Lessons that can combine multiple learning styles are often the most effective, as they can reach the most students. Also, since most people are a combination of learning styles, it makes sense that activities that combine learning styles are some of the most effective. Many of the activities already provided give opportunities for learners of all types to reap some benefit. If you try to be creative, you can make little tweaks in any lesson to reach different learning styles. Following are some ideas of ways to reach all four learning styles in one lesson or activity. Centers. The way this works is you have multiple different stations or centers throughout the classroom and you break your students into groups so there is a group at each center. Then, you provide different activities at each center and students rotate with their groups to each center. There are many benefits of this in addition to reaching students of all learning styles. Even if you don’t have a center that caters to kinesthetic learners, the simple act of getting up and moving to different places throughout the classroom will help them. The same goes for auditory learners as well; being in small groups and rotating throughout the room naturally invites discussion. Headphones. Allow students to use headphones while working independently in class. For most learning types, this can help cut out distractions around them, and for auditory learners, this can help them make connections between what they hear and what they’re learning. This can be very helpful for them during times when they need to work silently. Technology. Technology has come a long way and there are so many apps and websites available that can help students. For example, here is a list of apps for elementary math that appeals to all four learning styles. Games that include pictures and sound help visual and auditory learners. Reading explanations and lessons on the apps helps reading/writing learners. Physically manipulating and touching a device helps kinesthetic learners. A quick Google search will reveal beneficial websites and apps for any discipline. There is nothing right or wrong with any of the learning styles; they are simply names and categories for the ways different brains process information. Sometimes it is easier for those with a dominant reading/writing learning style to succeed in a traditional academic setting, thus landing those students with a “good student” label. Education has come a long way and schools and teachers are now catering to a variety of learning styles. It’s always important to remember that every single student is unique and even two students who are both visual learners might still differ very much in what works best for them. The best way to approach education is to learn about and understand each student. By remembering that all students are human beings who have needs and feelings, teachers can approach them in an empathetic way. If you’re interested in learning which learning style you are, you can take the VARK questionnaire. If you’re a teacher, it is a good idea to have all of your students take the questionnaire to help their learning. Not only will you be able to see what type of learners you have in your classroom, but your students will also be able to learn more about which ways to study and learn work best for them. Remember, a learning style is only one explanation of a student’s preferred way of learning. This style can change over time, and every student matches with each style to differing degrees. No matter what facet of education you’re coming from, you can benefit from understanding the learning style of yourself and those around you.